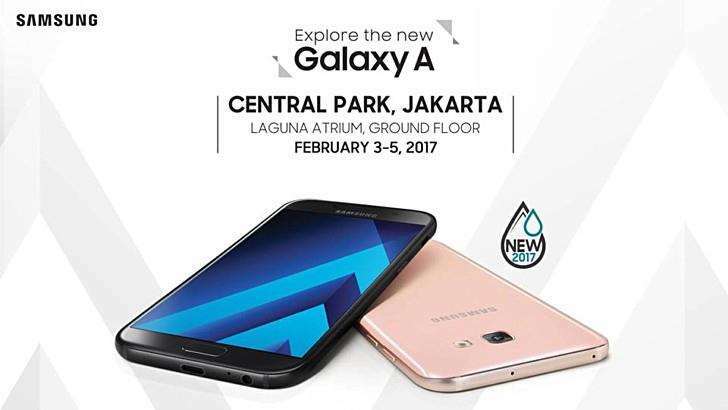 The new Galaxy A series is set to launch in Indonesia later this week at a press event in Jakarta. The news was revealed by the company’s social media channels. There’s no word about the pricing of the handsets nor their availability details for Indonesia. The new Galaxy A3, Galaxy A5 (2017) and Galaxy A7 (2017) are already available in Russia carrying a RUB 22,990 (around $386), RUB 27,990 (around $470), and RUB 32,990 (around $555), respectively. Samsung Galaxy A3 (2017) comes with a 4.7-inch 720p display, Exynos 7870 Octa processor, 2GB of RAM, 13mP camera for photos and videos, 2,350 mAh battery and ships with Android 6.0.1 Marshmallow out of the box. Samsung Galaxy A5 and Galaxy A7 comes with a 5.2-inch and 5.7-inch 1080p display, Exynos 7880 Octa Processor, 3GB of RAM, 32GB of internal storage, 16MP camera for photos and videos, and Android 6.0.1 Marshmallow out of the box. We’ll update you as soon as the handset is officially announced in other markets as well.